The Turtles turn on their TV to watch their favorite journalist as she interviews Von Zifflin. Suddenly a noxious gas fills the room and someone steals the meteorite. Before the thief can escape, he stops in front of the news camera, revealing himself to be the Shredder. Krang successfully crystallizes the Exaporon and demonstrates to Shredder how the crystals combined with his “enlarging ray” will allow a subject to grow six times their natural size. Shredder is the first test subject. While Krang is satisfied with the less than perfect results, he decides to do more testing on Saki above ground. Meanwhile, April has followed Irma, who has rushed out to get something to eat. Shredder emerges through the ground in one of Krang’s pneumatic modules. Via his com-link, Saki tells Krang to “send up the Exaporon Probe.” Within seconds it crashes through the street directly under April. Ms. O’Neil hangs on tight to the contraption and contacts the Turtles. Shredder becomes impatient waiting for Krang to activate the enlarging ray. Saki implores Krang to hurry up, but because April is still hanging on to the machine, she causes it to malfunction. Irma is zapped rather than Shredder. While April and the Turtles see to Irma, Shredder and the Exaporon Probe retreat back underground. Donatello is working hard in his lab, analyzing crystals that he found at the site of their most recent encounter with Shredder. Don realizes that Irma could be in BIG trouble (pun intended :). 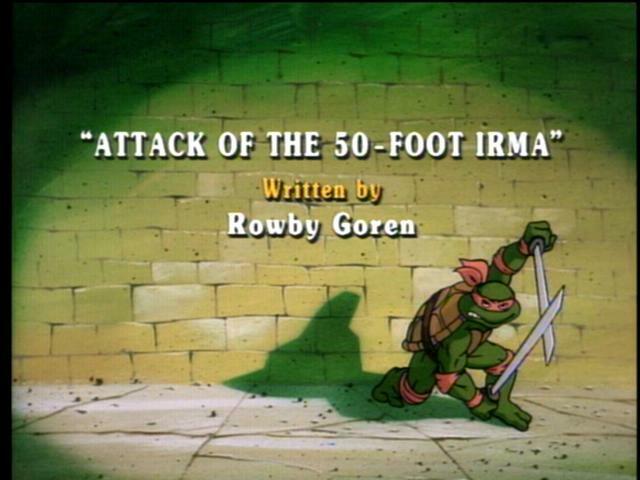 April contacts the Turtles to say a ten foot tall monster has kidnapped Irma… Donatello reluctantly tells April that Irma IS the ten foot tall monster… and she’s likely to grow much larger! The Turtles and April successfully locate the now 30 foot tall Irma and hide her from the Federal Troops who have been ordered to capture the “monster.” Donatello decides that in order to reverse Irma’s growth he needs more Exaporon. April tells them they can get it at the Planetarium where the meteorite is safely locked away. Posing as government officials, the Turtles convince Professor Von Zifflin to give them the other half of the meteorite for a top secret project: Project Irma. Shredder, Bebop and Rocksteady arrive to “liberate” the rock from them, but once again they are foiled by the Turtles’ expertise in martial arts. Shredder, Rocksteady and Bebop escape, but before the TMNT can pursue them, they’re contacted by April. It seems that Irma has woken up and has a serious case of the “munchies” and she’s heading for the city! Donatello mixes an antidote and the Turtles search for Irma. They finally spot her, but so does the military. While laser blasts explode around them, the Turtles convince Irma to swallow the pill – but she refuses telling them that when she was a little girl her mother always mixed the pill inside a bowl of ice cream. This give the Turtles an idea, and with the help of a cement mixer, they are able to mix the Exaporon antidote along with gallons of ice cream, thus enabling Irma to consume it before the military and Vernon, who thinks he is beating April out of an exclusive news story, arrive on the scene. Back at the Turtles’ lair, Irma celebrates her birthday by gorging on pizza. April reminds her about her diet, only to have Irma reply that she is through with diets – she just lost ten thousand pounds!